Do You Need More Money in May? Do you need to earn more money in your business – quickly? Would it help you to get an extra couple of hundred euro’s in your May commissions? You can get it if you want it. Here is how and most importantly, here is why. There is always a reason behind each of the business promotions that Nikken puts on – and it is always centred on helping you to achieve more. In the month of April we are offering pack bonuses for all enrollers of people who join in the month of April and purchase a Vital Pack. These bonuses will be paid out in May commissions – €40 for a Day Pack, €50 for an Environment Pack and €60 for a Night Pack. The more people you sponsor who purchase a Vital Pack in April – the more you can earn in May! There is another reason too! It is proven that when people join “right” they have a higher chance of succeeding later. Starting right includes purchasing a Vital Pack straight away. It helps to establish commitment. It encourages the Enroller to talk about the business opportunity too. It also helps the discussion on the new Enrolees goals and desires for success. What do they want with Nikken, when by? How can I as the Enroller help? One of the ways to help is to ensure they purchase a Vital Pack! 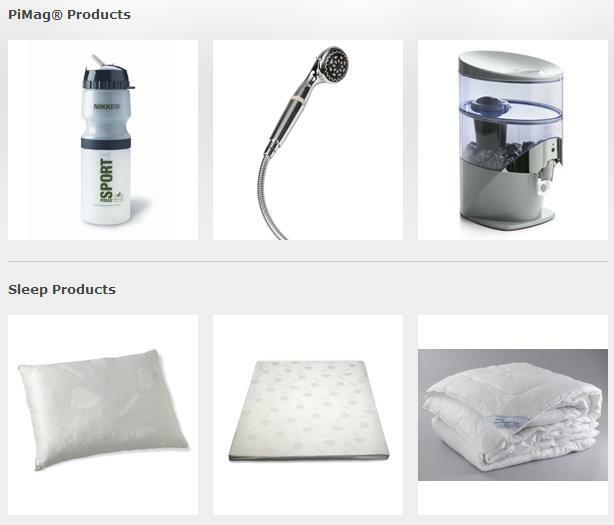 It offers them exposure to a range of products at a great price and encourages them to “Nikkenise” their homes. This helps for when they are meeting people or talking to others in their home environment and it eases the sense of having to sell something. Now, with product experience they can promote and recommend instead. That is much more comfortable. In addition to the above two reasons, the Vital Packs have great point value and if you and your team are striving to rank advance this month – this incentive will be sure to help. The key is to get the people in your group working on it too. It only takes half a dozen people in a group maximising this promotion and you can see your volume go way up. Remember, more points from product sold means more income. Please be sure to spread the message about this month’s special offer. Don’t just show people what they can earn – let them know the reasons why they will earn it. All the reasons why are centred on helping you, your team or your new enrolees the chance to do better and become more. YouTube is the biggest video streaming website, as well as being the second largest search engine on the Internet today. Created back in early 2005, and acquired by Google in 2006, YouTube allows users to share and upload videos. Video content can be anything: music videos, how-to, video blogging (more commonly known as vlogging), or piano playing cats. The very first video ‘Me at the zoo’ was uploaded at 8:27PM on Saturday 23 April, 2005 by co-founder Jawed Karim. Since then, 60 hours of video are uploaded every minute – that is more video content than the 3 major US networks have created in the past 60 years combined! Which begs the question – what is a viral video? A viral video is one that becomes popular through the process of online sharing, typically through social media and email. These videos often contain humorous content or eyewitness events and are more often shot by amateurs. With the rise of camera phones more videos are being shot in this medium, allowing for more people to become amateur videographers. A creator cannot simply intend for the video to become viral, as often a video becoming viral is an unexpected accident. In fact some universities are even starting to offer courses on the creation of viral videos, focusing on the marketing techniques and advertising strategies that can be learned from them. YouTube is not just for amateur videographers, as companies are seeing the power of video marketing on YouTube. Not only is it free to use, the social aspect allows them to reach millions of people all over the globe. Companies such as Coca-Cola, Cadbury, Orange, and Nikken Europe all use a YouTube channel to help market their brand. At Nikken Europe, we host a variety of content on our site to display different aspects of the company such as our events, behind the scenes footage of the European HQ, and of course our products! Recently rebranded, Nikken Europe’s channel has been divided into playlists by language to make it easier for our Consultants and Customers across Europe to find videos in their own language. Sometimes we are not able to make videos in every language, in instances like this we try and provide subtitles in the various languages. 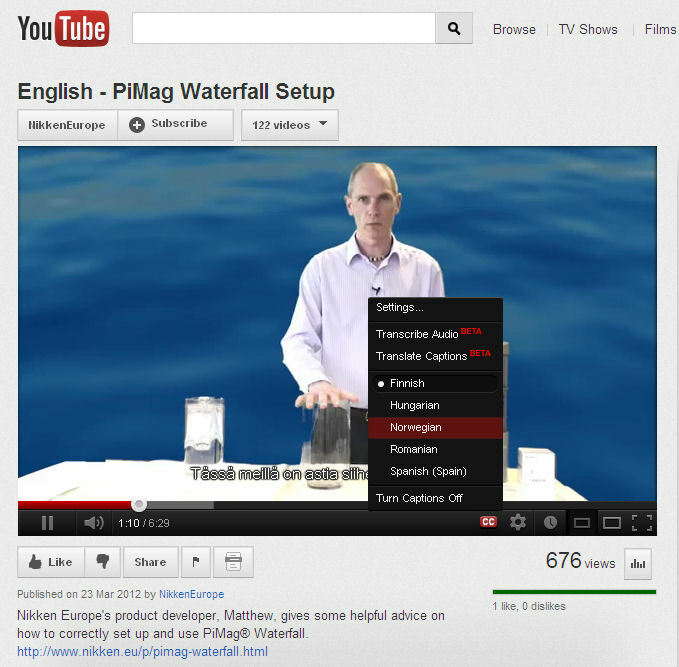 For example, on our video English – PiMag Waterfall set up you can view the video with subtitles in Finnish, Hungarian, Norwegian, Romanian, or Spanish. Simply click the button ‘CC’ at the bottom right corner of the video and select your video (as shown below). How can you use YouTube? YouTube is really simple to get started on. Many users have accounts not to upload their own videos but to subscribe to people and companies they’re interested in. These users still participate in the social aspects of YouTube such as sharing videos, creating playlists, and leaving comments. Perhaps you are one of these users, but the only reason you choose not to upload videos is because you’re afraid of where to start or that it is too complicated. We promise you it is not. Your video can be about anything. Just follow these 5 helpful tips and you could be on your way to be the next YouTube Celebrity! DON’T worry about using fancy equipment; a camera phone can be just as good! Did you find this blog post helpful? Would you like to know more about YouTube? 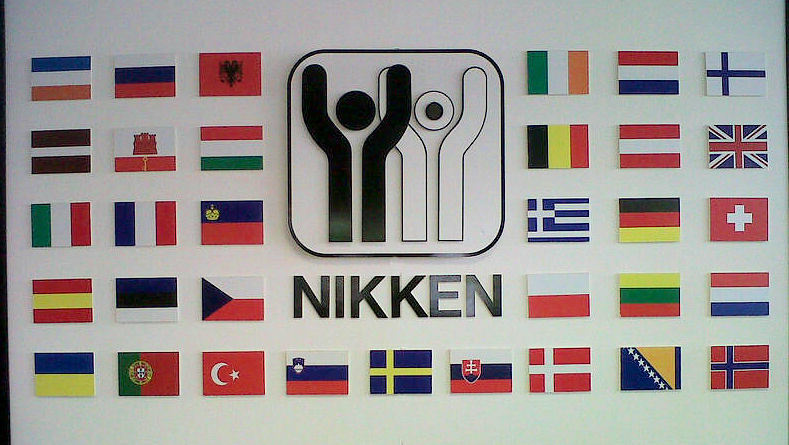 Let us know on Facebook or Twitter (@NikkenEurope) and be sure to subscribe to Nikken Europe’s YouTube channel! The PowerChip™ premiered at the March launch events before being released for general ordering on 2 April 2012. There are a number of great uses for the PowerChip™, such as wearing it as a pendant, but there is one that I bet you didn’t think of… as a game! Introducing… Spot the PowerChip™, a hidden object game in which you are shown an image and you must, you guessed it, spot the hidden PowerChip™! Some will be really easy, while others will be hard. But it won’t be just us providing the images; we want you to join in the fun too! You can post your photos on our Facebook page, tweet them to @NikkenEurope by using the hashtag #SpotPowerChip, or follow us on Pinterest and pin it to our Spot the PowerChip™ board! Can you spot the PowerChip™? Don’t spoil the fun and tell people where the PowerChip™ is, but DO brag if you’ve found it! The image must be taken by you! Meaning don’t photoshop the PowerChip™ into an image, that’s cheating! Most importantly – have fun with it and be creative!